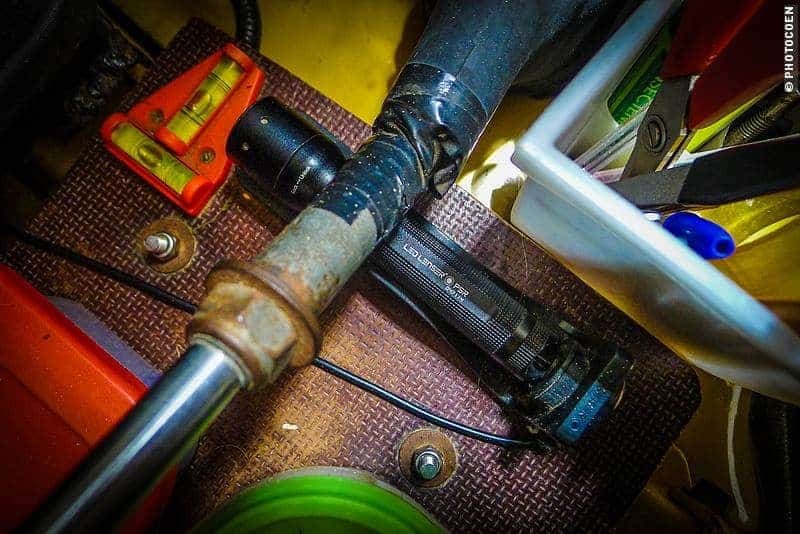 When we bought the Land Cruiser, the previous owner had left a bracket that can hold a big MagLight torch and it was conveniently placed behind the driver’s seat. This was great because I happened to have such a sturdy and robust torch. It is heavy, which is good in case of peril because you potentially can hit someone with it. Furthermore, it uses common D-cell batteries which you can buy everywhere and its beam can zoom from flood to spot. Truth be said, it was really heavy and we don’t want to hit anybody at any time, so the torch was pretty useless for that. More importantly, the few times we did need the torch (we also have two Petzle lights), the light would have grown weak due to depleted batteries. 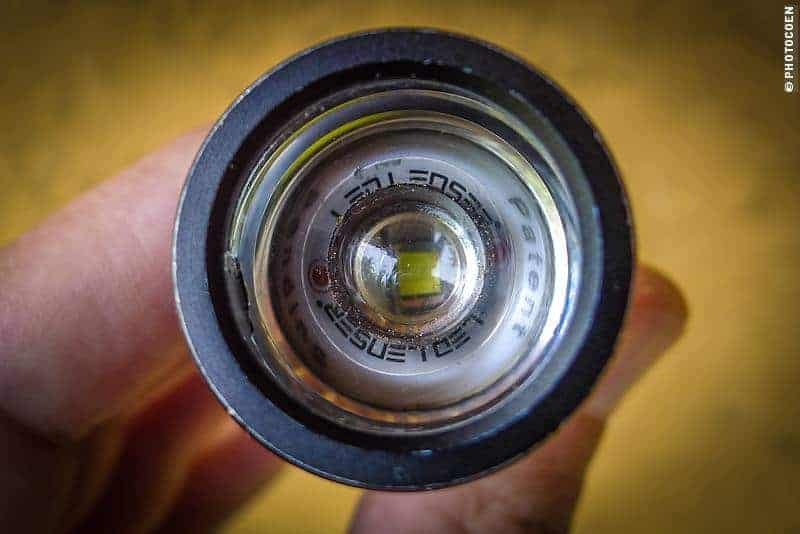 In May 2009, Jan, a fellow overlander, showed me his LED MagLight with 700 lumen . I was smitten. Sure, it still weighed a ton, but the brightness of that beam was awesome. Plus it was rechargeable. So no more need to buy those big D-cells anymore. But after a few emails with Jan and talks with Karin-Marijke (which are always good to get my feet back on the ground again) about the subject, I was convinced not to go with the big and heavy but would go for something small, powerful and rechargeable. While some of them fitted my needs, others were too big or too expensive to my liking. On the other hand, the little Pelican appealed to me. That’s where my friend Edwin came in again (here you can read how he upgraded our GPS). His company sells lighting products from a small German company called Die Zweibrüder, who are known for their innovative and quality lights. You might know their torches under the name of Led Lenser. He gave me a Led Lenser P5R. Precisely what I needed: a powerful beam packed in a small device. The torch is very light. Throw it in your daypack and you won’t even notice it’s there. It fits in my trousers pocket comfortably, which is handy when we leave camp and plan to return when it’s dark. If you don’t like it in your pocket, no sweat: the torch comes with a handy, rotating belt clip. It also comes with a small holder for storing and charging. And this is where the magic comes in, I find. They made the on-and-off switch so that it acts as the charging contact. When you place the P5R in its holder, it snaps securely into place because of the magnetic charging head. It’s almost like the MagSafe connector from Apple. I have set up our Led Lenser so it sits between the two front seats and is easily accessible. The unit comes with a long-enough USB wire so that I routed under my seat to the 24-volt outlet just behind my seat. That is another thing I like: It charges straight from any USB socket. No fussing with a separate charger and separate batteries. 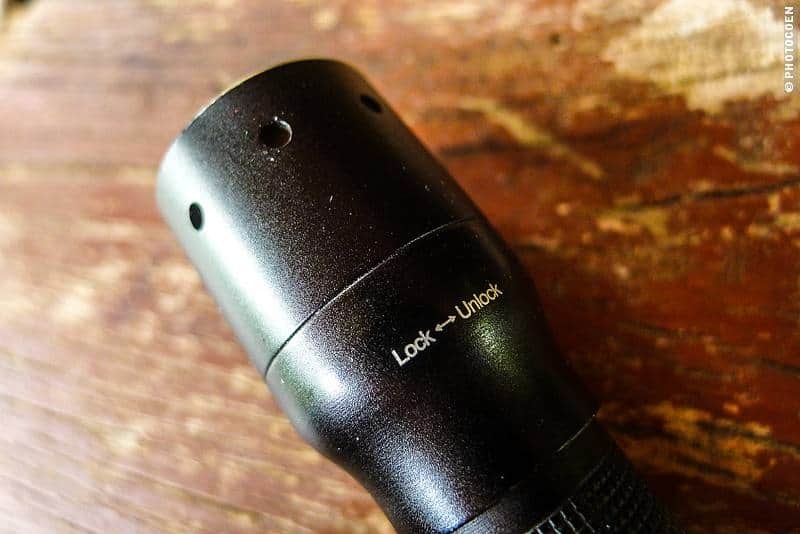 If you have never used one of these “modern” flashlights before, it may take you some time to get used to switching it to the different modes. The on-and-off switch is not located at your thumb nor can it be switched on by rotating its head. The microswitch is smartly integrated with the charging connector at the base of the unit. One click unleashes the most powerful beam the Led Lenser packs. Subsequently, fast clicking cycles you through the different modes; high, low and flashing. You can also focus and widen the beam with a slight slide of the head which you can lock by twisting it to the side. We’ve had the P5R for a couple of years now and while it had some quirks with the on-and-off switch after a year (the company replaced the micro switch under the 5-year warranty), the torch performs flawlessly and we’ve never been in the wild with a feeling we were underpowered in terms of lighting. I think Led Lenser is a great company and lives totally up to my expectations. After all the poor experience we have had all these years with our Petzle headlights, I think it is time to switch our headlight as well and see how the Led Lenser SEOs will perform.